Are software-specific MIDI controllers a good idea? 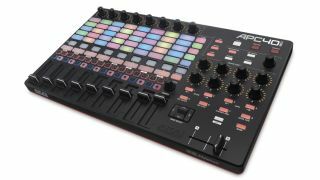 Akai recently released the mkII version of its Ableton Live-friendly APC40. With the current generation of platform-agnostic MIDI controllers being so eminently capable and flexible, why would anyone want to limit their options with a model designed to only work with one specific application? Six vested interests state their cases. "Generic MIDI controllers that work with any software are powerful, but they also have limitations; they can only access the parts of the software that are available to the outside world. One advantage that software makers have when building their own hardware is that they can provide access to functionality within the software that might not be exposed to third-party hardware manufacturers. They can also develop the hardware and software in tandem, making sure that each is optimised for the other." "They're a great idea, and we've seen many examples of how well this can be done over the past few years! For our Reason software, we've made sure that anyone can create in-depth Reason integration through our Remote protocol. We want this to be open so that the controller market can thrive, continue to innovate, and that there will be something available for everyone, whether you want a custom-made iPad controller app or a deeply-integrated MIDI keyboard." "Absolutely. You want your MIDI controller to work perfectly with the software you use - not the stuff you don't even own. For Novation users, that's usually Ableton Live. We use our deep understanding of how people interact with Live to make sure every knob, button and fader integrates seamlessly with that software. Attempting to achieve the same degree of simple yet functional integration across multiple pieces of software would be far less desirable - it would add complexity, dilute the integration and include unnecessary features that would disrupt workflow." "While dedicated controllers for a certain plugin have their advantages, it's important that these controllers also allow you to work with other software on the market. Today's producer doesn't want to be limited to one or two sounds. That's why on products like the MPC, we make sure the control surface is extensible to work with other software, can host everyone's plugins, and run in anyone's DAW seamlessly." "We created the Komplete Kontrol S-Series to provide customers with the experience of using a premium hardware instrument, but with the convenience, flexibility and power provided by our Komplete virtual instruments. "As we control the design of both the hardware and software parts of the system, we're able to treat them as a single entity. This allows us to create a level of two-way integration far beyond what could otherwise be achieved, enabling features such as the Komplete Browser, Native Map and Light Guide." "They are a good idea. In the past 20 years, generic and modular controllers have realized the dream of controlling software parameters without a mouse. Since that dream has come true, we have moved on to desire more sophisticated usage in workflow and performance. It's difficult to address those desires without a union of software and hardware. "I predict further "silo-ing" between DAWs as software makers become the new hardware makers. This may not bode well for customer freedom, but we'll accept it because workflow trumps independence."